After the murder of St Thomas Becket in 1170, by knights acting on behalf of Henry II, the saint became the centre of a widespread cult, popular throughout Europe. The episode of his martyrdom became one of those most frequently depicted in art. 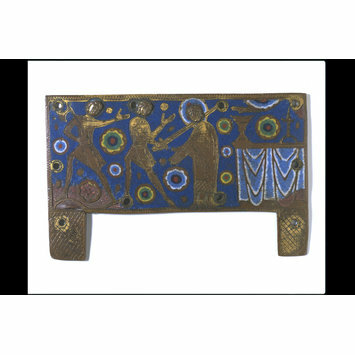 The subject was very popular with the Limoges enamel workshops (see the Becket casket, M.66-1997). This may be due to the particular popularity of the Becket cult in western France - Becket had travelled to the Limousin in the 1150s, and had a close relationship with Louis VII of France. England had also recently been united with Aquitaine (of which Limoges was capital) under Plantagenet rule. The cult was also widespread throughout Europe from Hanseatic Germany to Naples and Sicily - Limoges enamels depicting the story are found wherever the cult spread. Many religious houses and churches throughout Europe were dedicated to the martyred archbishop, and many of these held relics of the saint, disseminated in a deliberate policy from Canterbury. The story was therefore illustrated by the enamellers particularly on reliquary caskets, or chasses. In a recent inventory, 52 extant examples were listed, consituting the most important group of Limoges chasses dedicated to one particular saint. They seem to have been exported all over Europe. This plaque once formed part of such a chasse. Interestingly production of Limoges enamels depicting this scene seems to cease in about 1220, the year in which Becket's remains were translated to a golden casket placed in a shrine at Canterbury Cathedral. Perhaps, from this point onwards, relics of the saint were no longer in as ready supply as they had been previously. The plaque is relatively small. From other complete Becket caskets we can presume that it came from the front of a small shrine-shaped chasse, and that an image of Becket's body being entombed, or possibly his soul rising towards heaven, was shown on the sloping front above it. 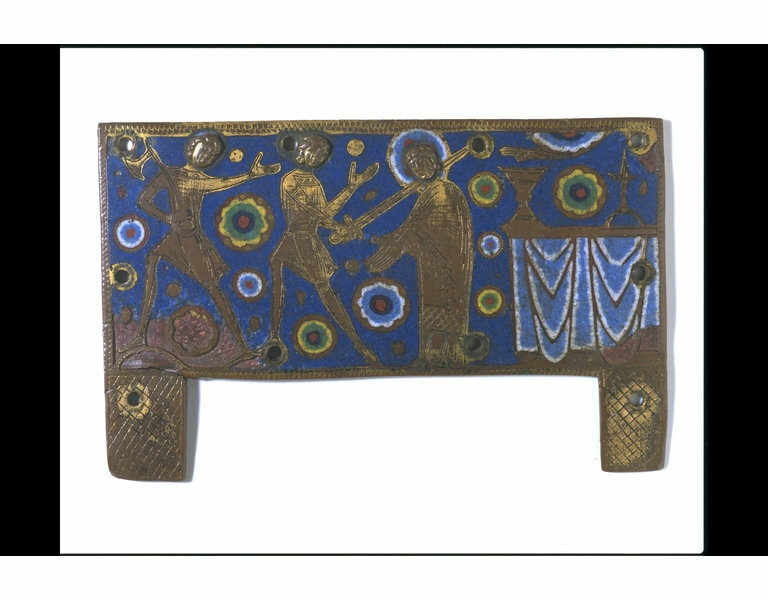 The ends are likely to have had apostles or non-figurative decoration, and the reverse to have been decorated with non-figurative enamelled plaques, decorated with a pattern of lozenges or rosettes. 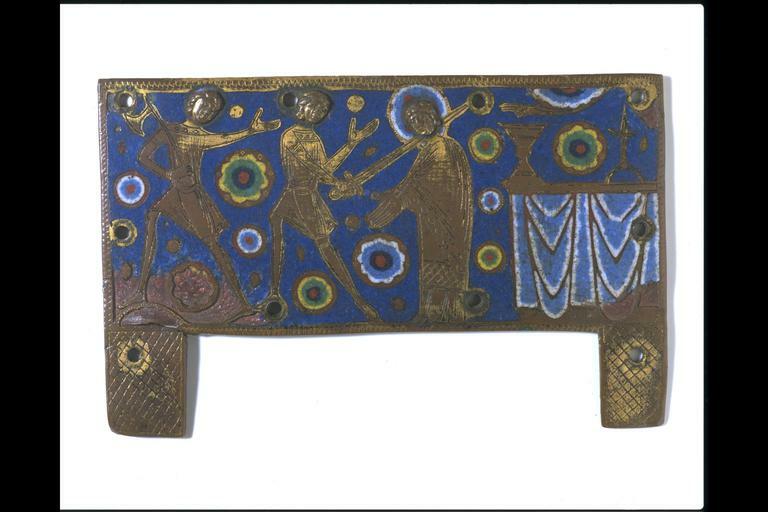 The composition of this plaque is similar in type to other versions of the martyrdom of Becket seen on Limoges caskets. The key features of the plaque all appear in other examples: two assailants with the figure of the saint to their right, the altar, with its heavy altar cloth and gilded chalice and candlestick, and the hand of God the Father reaching down. Interestingly, no part of the story (as told by chroniclers) indicates that the archbishop was actually surprised at Mass, or even near an altar. The inclusion of the altar, and St Thomas's archepiscopal vestments, in all the representations is evidentally intended to stress the desecration of the sacred space of the cathedral by the murderers, as well as the triumph of spiritual power, as St Thomas is killed while celebrating the sacrifice of Christ, the greatest martyr of all. The animated poses of the two knights, contrasted with the static figure of St Thomas, are a feature of many of the other Becket caskets, and can be connected to the Romanesque tradition in western France, while the reserving of the figures against the blue enamel ground, and the modelling of their heads in half relief, is part of a wider stylistic change in Limoges enamelwork in the later 12th century. Horizontal rectangular copper-gilt plaque, with a projecting foot at each end of the bottom edge. Two knights are depicted full-length. The leftmost figure's legs face to the left, while his upper body is twisted round towards the right. He holds an axe in his proper right hand, and holds his proper left hand out towards the archbishop. The second knight stands to his right. He also faces left, but twists round towards St Thomas. He holds a long sword in his proper right hand, which he is using to sever the archbishop's head. His proper left hand is held up towards the saint, in a gesture of acknowledgement. The saint stands facing towards the left, with his arms stretched forward and down in prayer. He wears the vestments, and is bare-headed, though he has an enamelled halo. His head is slightly bowed. All three figures have bodies reserved in gilded copper, and heads formed from separate pieces of metal fastened to the plaque. To the right of St Thomas is the high altar of Canterbury Cathedral. It has a blue enamel altar cloth, and a gilded chalice and candlestick. Above the altar, the hand of God emerges over the chalice, in a blessing gesture towards the saint. The background of the plaque is blue enamel, decorated by circular and lobed enamel motifs. The feet are engraved with cross-hatched decoration on a gilded background. There is a major area of lost enamel in the lower left-hand corner of the panel, where the champlevé borders are clearly visible. The composition of this plaque is similar in type to other versions of the martyrdom of Becket seen on Limoges caskets. The key features of the plaque all appear in other examples: two assailants (also seen in the Louvre casket, OA 11333), the figure of the saint to their right, facing towards the knights (the Ashmolean chasse), the altar, with its heavy altar cloth and gilded chalice and candlestick, which features in most other representations of Becket's martyrdom, as well as other Limoges scenes in church settings. The hand of God the Father reaching down is also a feature of other representations - seen on the Ashmolean example. Some versions of the scene, particularly on the larger and grander caskets, show extra figures to the right of the altar, particularly horrified clergy (eg M.66-1997, the Becket casket). Hahn, Cynthia. 'Production, Prestige, and Patronage of Medieval Enamels'. In: From Minor to Major. The Minor Arts in Medieval Art History, ed. Colum Hourihane. Princeton: Index of Christian Art, Dept. of Art and Archaeology, Princeton University, in association with Penn State University Press, 2012. Later Limoges caskets have the heads of figures engraved directly onto the copper ground, rather than depicted in bas-relief as here (see cat. 28, Notin 1999, dated 1210-20).